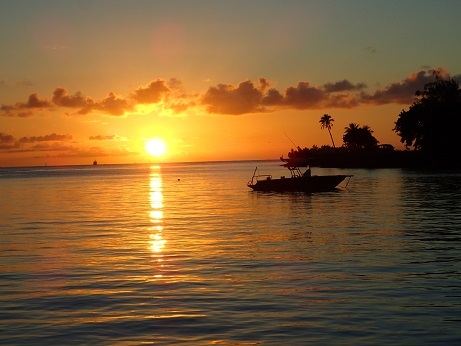 Perfect sunset in Bora Bora's MaiKai Marina mooring field. Hiva Oa, Marquesas, our first French Polynesian stop is the best smelling place I've ever had the pleasure of whiffing. 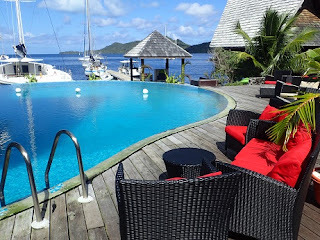 We're at the tail end of our French Polynesian sailing as our visa expires July 21st so by the time this blog posts, we will be officially checked out of the country. 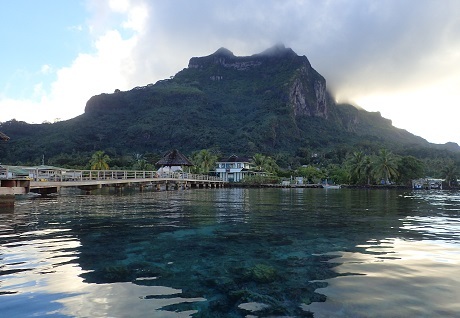 We're ending our French Polynesia visit in Bora Bora. 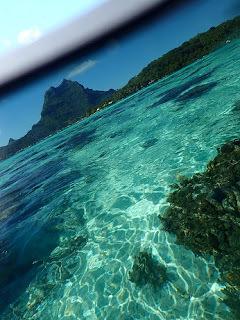 There's a certain irony in that Bora Bora, one of most iconic places we've stopped, kind of stunk, literally. We had the crappy luck of being downwind on two garbage pickup days in less than a week.... Lots of oh-da-fish odor further "enhanced" by baking in Bora Bora's tropical heat. Just not what you'd expect in the land of hoity-toity $700/night over water bungalows. an atol through Maui Jim sunglass lens. Yet there's no denying between the towering saddle-topped Mt. Otemanu to Bora Bora's beautiful blue water-sky pallet from turquoise pool-water blue to midnight and seemingly every hue in between the island is a stunner (click here for more beautiful Bora Bora photos). If I were asked about the snorkeling though I'd say Bora Bora falls far short of Tuamotus. Closer to the States, the US and British Virgin Islands or in the States, Hawaii (for those of us who prefer warm water) are rife with much greater density and variety of sea life and corals. I would also pick the US and British Virgin Islands or in the States, Hawaii and the Bahamas for great walkable, swimmable beaches over the oft coral strewn and narrow beaches of Bora Bora. While far harder to get to, the Marquesas' Fatu Hiva Bay of Virgins gets the runaway prize for most spectacular and certainly surreal anchorages. Bora Bora's not even in the running in my book. Viatape's Robert Wayne Pearls dock. Nice coral. nd yet. we would've felt we skipped a must-do if we didn't stop at Bora Bora. But if I had my 90 day French Polynesia visa all over again, this would be my itinerary - assuming no need to go any place to replace or fix anything broken. If you've traveled this track. what's your recommendation? If you're yearning to make this trip, what qualities are make your "bucket list" stops? instead he humored me for an afternoon at an atoll. This post was written in Viatape, Bora Bora (S16.20.995 W151.45.388), our last stop before our 90 day visa expired July 21st. We stopped at a nearby atoll S16.30.314 W151.46.438 for a better view and snorkeling. By the time this posts we'll be on our way to Tonga with a stop in American Samoa and potentially Cook's Suwarrow on the way. Will set several catch-up blog posts to run while we're on passage, internet permitting.